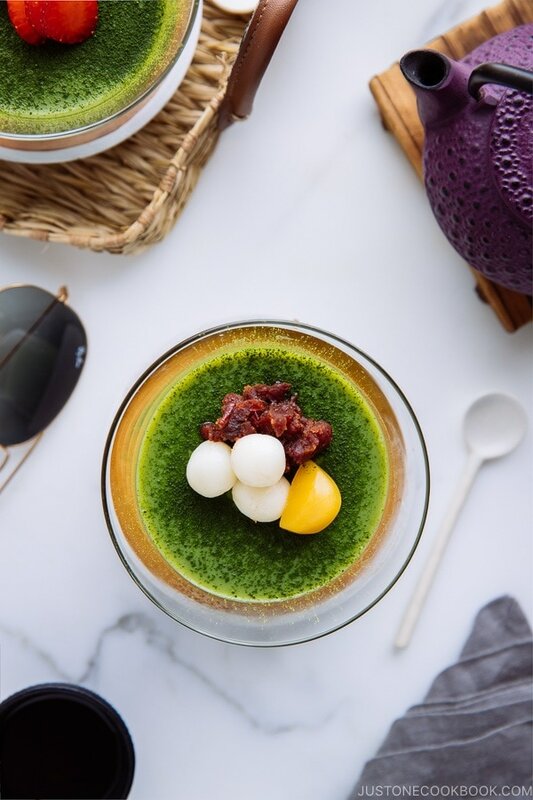 Try this DELICIOUS and CREAMY Matcha Panna Cotta that’s VEGAN! It’s made with soy milk, kanten powder, sugar and matcha. Served on beautiful glass ramekins, they will look smashing on your holiday table. Hello matcha lovers! I know how excited you are to see a matcha recipe and I’m happy that you clicked through to see this post. Panna cotta is Mr. JOC’s all-time favorite dessert. Okay, let me say he does have a lot of “all-time favorite” desserts, but in all seriousness, I know it will be your favorite too. To make a healthy and lighter version of the dessert, I decided to make Matcha Vegan Panna Cotta (ヴィーガン抹茶パンナコッタ). Don’t let the fancy name fools you though. It’s actually very easy to pull off, so make this dessert today! First of all, panna cotta is a chilled cream pudding made of cream, sugar, and gelatin. As you see, there is milk (and heavy cream) and gelatin made by prolonged boiling of skin, cartilage, and bones from animals. 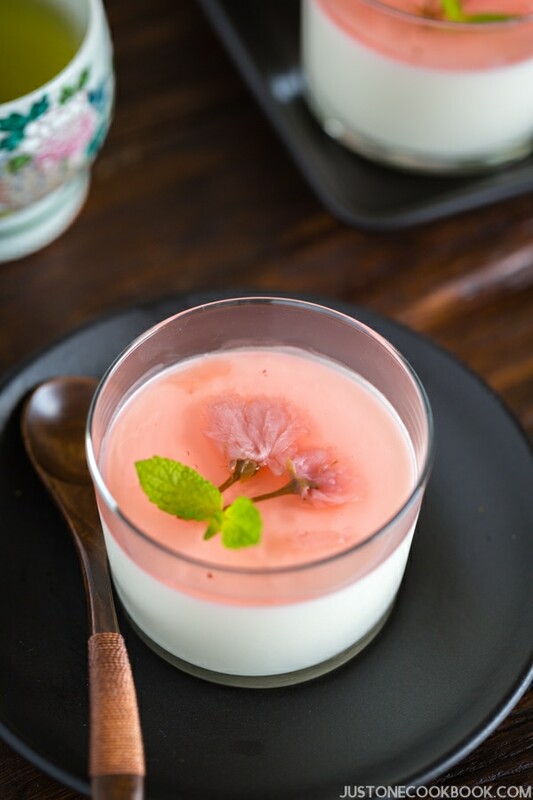 To make panna cotta vegan-friendly, I used Kikkoman® Pearl Organic Soymilk (unsweetened) and Japanese kanten powder. 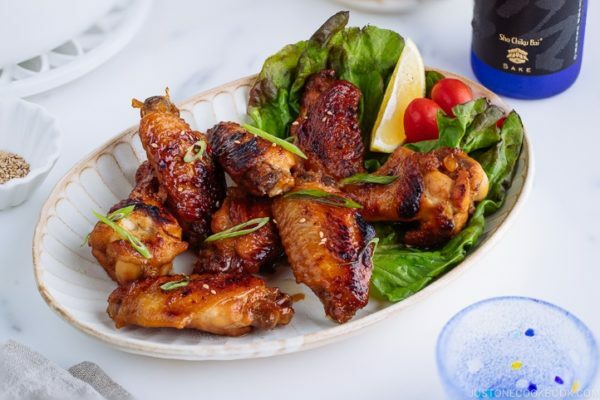 For this recipe, I’m partnering up with Kikkoman® by using their Pearl Organic Soymilk, which is vegan, cholesterol-free, preservative-free, lactose-free and lower in fat and calories than regular milk. 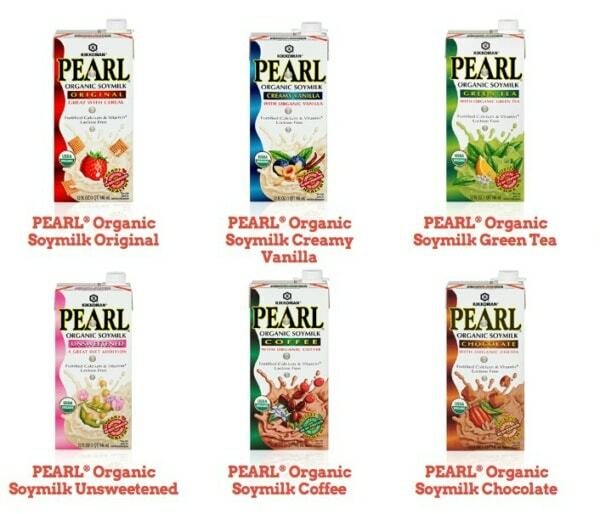 The soymilk comes in rich, creamy 6 flavors! My kids like the “Chocolate” flavor, but I almost always buy the “Unsweetened” version so I can use it to make savory dishes like Vegetarian Ramen and Soy Milk Hot Pot. Usually, panna cotta uses gelatin to get that silky, creamy, wobbly texture. 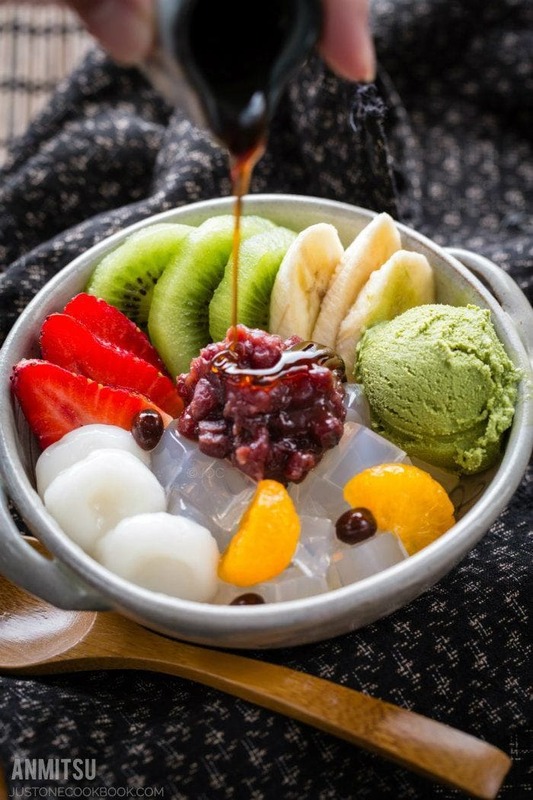 To make this dessert vegan-friendly, we use Japanese kanten (agar agar). Kanten (寒天), or sometimes called agar agar or agar, is a white and semi-translucent gelatinous substance obtained from algae. It is a great alternative to animal or chemical-based gelatin. 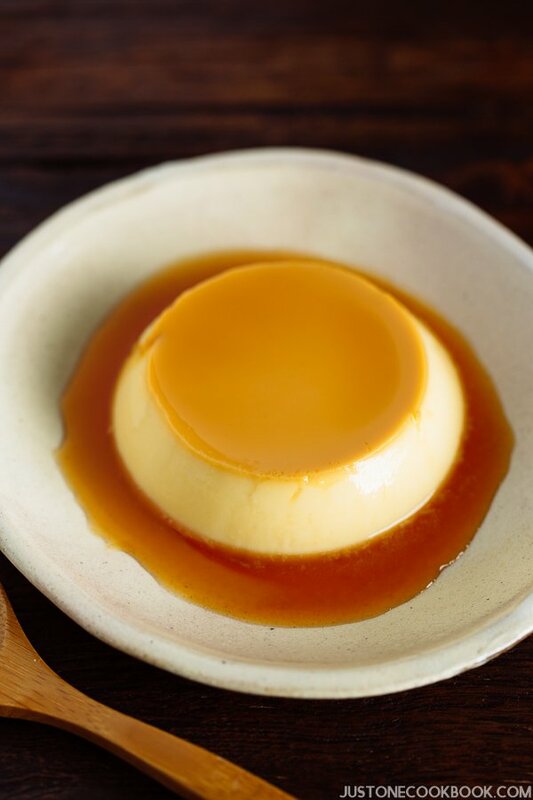 Once it’s chilled the texture is on the firmer side, so we use less kanten and more liquid to re-create that gelatin-like creamy, wobbly texture. To learn more about Kanten, I have a pantry page dedicated for Kanten (agar agar) where you can read more about. 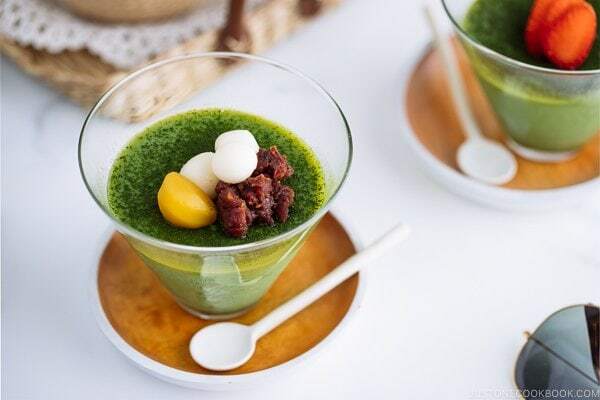 You can serve this dessert as it is, because the green matcha color is so beautiful already. However, I’m sharing 3 version so you can dress up the dessert a little. Have you used gold flake (gold leaf) for your food? Gold leaf is gold that has been hammered into thin sheets by gold beating and is often used for gilding. 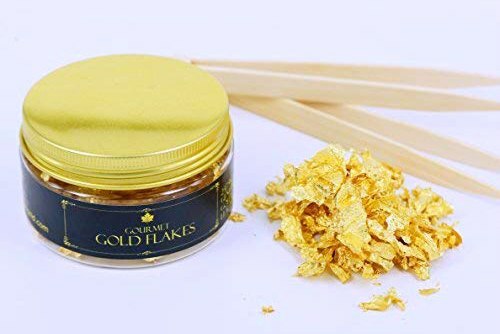 This edible genuine gold leaf flakes by Barnabas Blattgold (150 mg, made in the USA) can be purchased for $35 on Amazon. 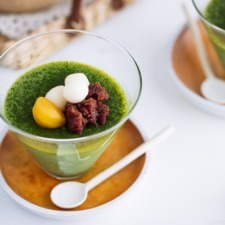 Besides placing it on top of Matcha Vegan Panna Cotta, you can use it to decorate cupcakes, cocktails, entrees, chocolate, sweets, candies, confectionery, desserts, pastries, wedding cakes and more! There are lots of flakes in it and if you enjoy hosting parties or making desserts often, I think it’s fun to keep it around in the kitchen. 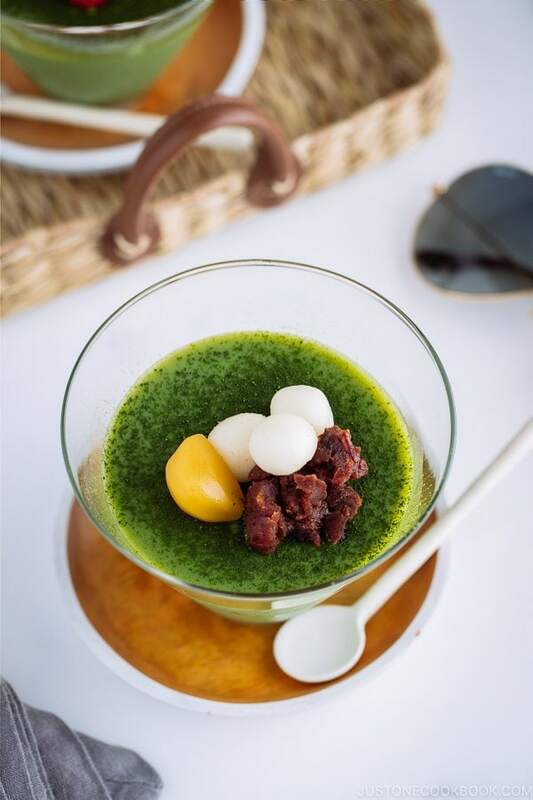 For an extra Japanese touch, top your Matcha Vegan Panna Cotta with Shiratama Dango, Anko (red bean paste) and chestnut (in syrup). It’s quick to put together once you prepare the toppings ahead of time. Buy a jar of chestnut in syrup from Japanese grocery stores or Amazon (Turkey or French brands). No time to buy gold leaf flakes or make it fancy with Japanese ingredients? Adorn it with fresh fruits and chocolate. Over here, I topped the panna cotta with an assortment of strawberry slices and blackberries. If you like, I think some chocolate curls or shavings will be nice too. I hope you enjoy this creamy and delicious Matcha Vegan Panna Cotta recipe. 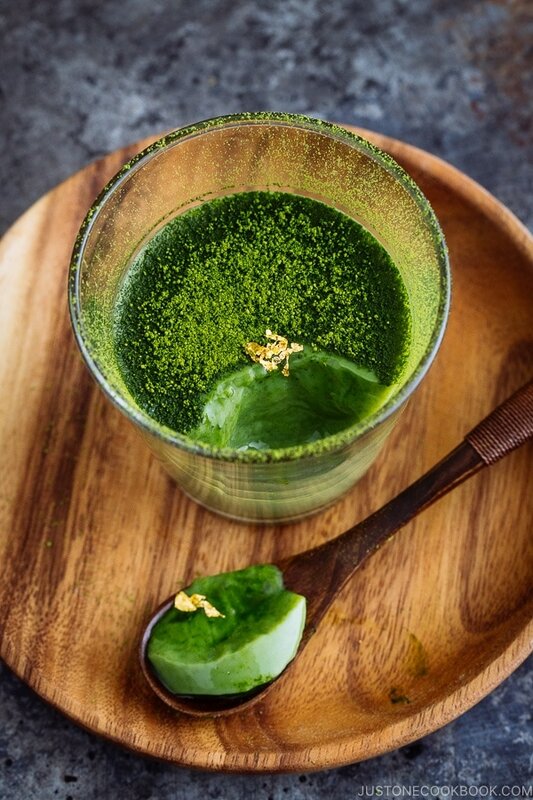 For more matcha treats, you want to check out these Must-Try Matcha Recipes at home. Try this DELICIOUS and CREAMY Matcha Panna Cotta that's VEGAN! It's made with soy milk, kanten powder, sugar and matcha. Served on beautiful glass ramekins, they will look smashing on your holiday table. In a small saucepan, heat soy milk over medium heat until warm to the touch. Keep a close eye on the pot and DO NOT BOIL. Turn off the heat. In a bowl with matcha green tea powder, add a little bit of soy milk. Now using a whisk or chasen (bamboo whisk), combine the soy milk and matcha together. 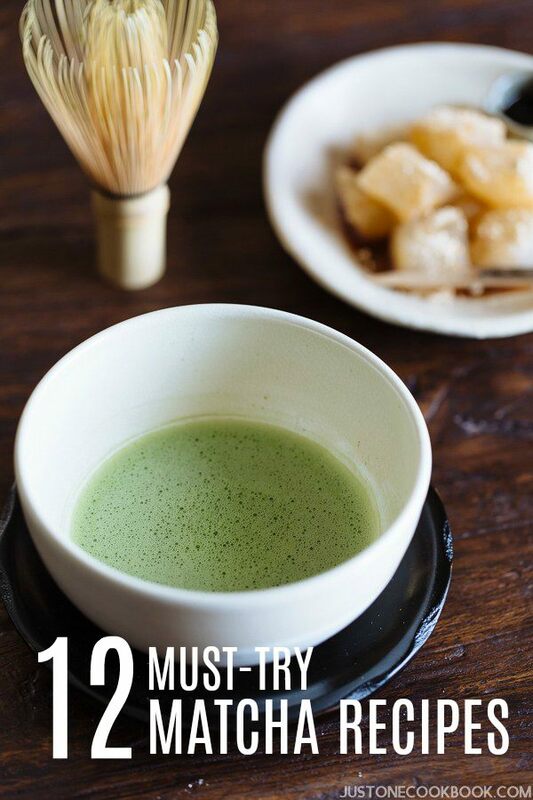 Tip 1: Matcha dissolves easier when liquid is warm. Tip 2: Gradually add in the soy milk. DO NOT pour too much soy milk at once. Superfine matcha powder can easily turn into lumps and it will be harder to combine. Add more soy milk as you needed, until the mixture becomes a smooth paste and there are no more lumps of matcha. Add the matcha paste back into the soy milk in the pot. Whisk it well to combine. In a new pot, add water and powdered kanten (agar agar). Whisk together and bring it to a boil on medium-high heat. Once boiling, reduce the heat to low and cook for 2 minutes until the powder is completely dissolved. Add the sugar and whisk to combine with the mixture. Then add the matcha soymilk into the pot. Give it another whisk until well combined, and turn off the heat. Prepare the glass ramekins or containers on a tray. Place the strainer over the ramekin and strain the matcha soy milk mixture. Divide the mixture evenly. Using a spoon, collect the small bubbles into one corner of the ramekins and scoop it all up. Chill in the fridge for at least 2 hours to set. To Serve, sprinkle extra matcha on top using a fine mesh strainer. For these ramekins, I placed gold flakes on top (You can buy these gold flakes on Amazon). For this ramekin, I sprinkled matcha and decorated with the berries. For the last ramekin, I placed anko (red bean paste), mochi (Shiratama Dango), and chestnut. Read more about agar/kanten powder and measurement here. This looks great, but I can’t have soy milk – wondering if a nut or oat milk can be substituted? Thanks! Do you have a regular (non-vegan) version of this? 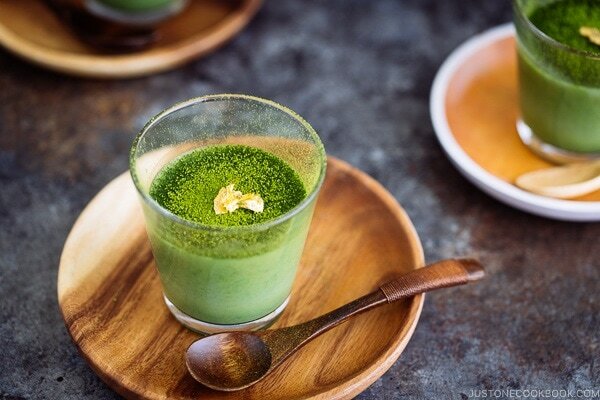 Would it just be 1 Tbsp matcha to about 3 cups liquid in whatever my preferred regular panna cotta recipe is? 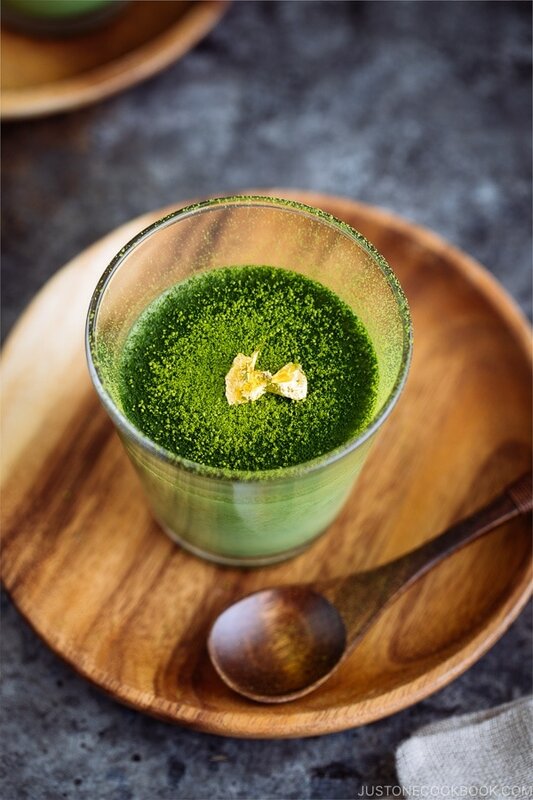 Which exact brand of matcha powder would you recommend? I have tried a few that I bought from Asian markets but the color turned grayish green after cooking. I need something that stays bright green like yours. I also live in the Bay Area. Please advise. Thank you! Hi Michelle! I usually get my matcha from a Japanese grocery store (Nijiya). 1. Can you pour the mixture into those clear plastic cups that you see in dessert buffets? Will the mixture be too hot? 2. Can I triple the recipe? Thank you for your reply about cooling the mixture (and the tip to keep stirring) before pouring into plastic cups. I just love your recipes! Thank you again. You’re very welcome, Sharon! Hope you enjoy! I’m going to be making this sometime this week. But, there’s something I’m confused about. What kind of anko paste did you use for this? 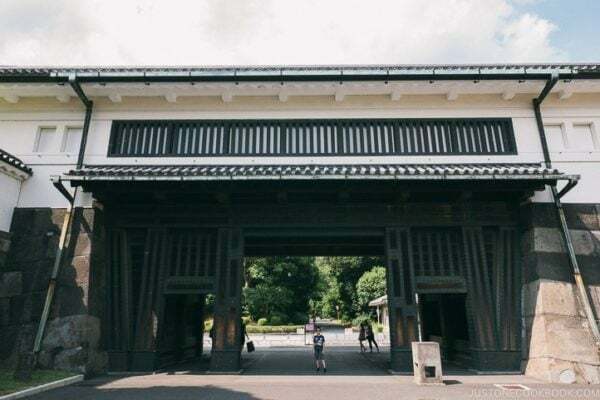 Tsubuan or Koshian? Hello there, great recipe thank you. I have one question please as in the measurements page it is written 1 tsp of agar powder for 250 ml of water…Your recipe requires about 3 cups of liquid and only 1 tsp of agar…Is that correct? Hi Monica! I explained in the blog post but I wanted to make this dessert more Panna Cotta texture. If you follow the measurement from the box, you will get very firm texture of panna cotta because of agar/kanten use vs. gelatin use. Gelatin is easier to create wobbly texture, but kanten can’t. So I tested my recipes many times by reducing the amount of kanten to make it similar to panna cotta texture. Hope that helps!